Cats are attracted to the wool's lanolin oil; humans love that the wool is naturally odor resistant. Cats will be more than ready for a catnap in this dreamy handcrafted pet bed. Its enchanting dewdrop shape is adorned with green leafy tendrils. Made from felted wool, the bed is soft, durable, and cozy warm. Cats are attracted to the scent of lanolin oil in the wool, and humans love that the wool is naturally odor resistant. In addition to providing an inviting new home for your feline friend, this cat bed also helps provide a better life for the people who made it. It is made by underprivileged women artisans in Nepal, offering them a chance to turn their traditional skills into better homes, nutrition, and education for themselves and their families. Designed by Kinza Lhamo. Handmade in Nepal. Kinza Lhamo is creative designer of Hamro Village with strong focus on conceptual design, sales and marketing. Her work within the Fair Trade community has given her a profound understanding around key issues such as ethical sourcing, consumer behavior and social justice. All of which inspires her to design and reconcile the traditional creativity with the modern touch. Growing up, she moved with her family across Bhutan, spending a few years in the landscape of ancient Bumthang valley and Punakha, which is surrounded by beautifully handcrafted Dzongs (monasteries). As a young adult attending the Fashion Institute of Technology, she experienced the creative life of New York City, which she calls "the big change for me." Light cleaning: Vacuum clean to remove hair and dust. Stuck-on dirt: Spot clean with a soft cloth or sponge, a mild detergent and warm water. Full wash: Gentle hand wash in warm water using mild detergent. Reshape while damp, and let it dry on a hand towel. Love the design and the social mission behind the business model. Cat immediately loved it and it looks stylish! Very happy with this purchase! Only negative is that our cat likes to move around, sit in different positions, and lean against the edges inside so it is getting a little bit deformed and and slightly collapsing at the top â€“ thinking about bending a coat hanger to keep it propped up better. It is so cute. Love it. 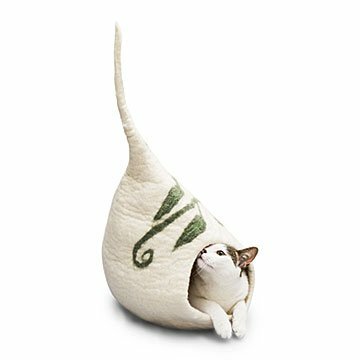 Please, please make this or the Meow Cat Bed in an XXL for our XXL feline. He loves it and got his head and shoulders in it, but couldn't fit the rest of his fluffy oversized body in. Very nice but not big enough for our 15+ lb cat. He does love it though! Butters loves his new bed! A beautiful piece of functional art! It is lovely and the cats like it too. I wanted to add a little whimsy to the living room and my largest cat named Butters, went right in and fell into a comfortable sleep. That is testament alone as to why it's a great addition.